Mari’s Garden owner Fred Lau in one of his greenhouses. Gov. 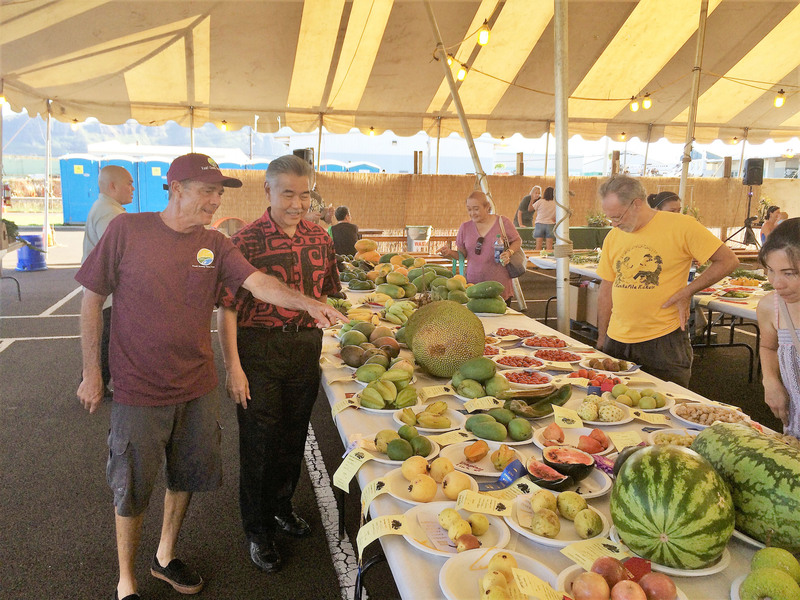 Ige with Kaua’i Farm Bureau president Johnny Gordines. 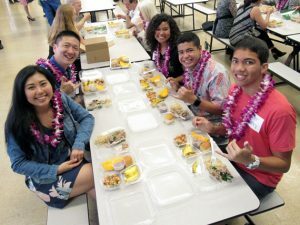 Mililani High School students enjoy their ‘Aina Pono lunch with former Lt. Gov. Doug Chin. the Food Safety Modernization Act. It also has launched a study to test for pesticide residues in the state’s surface waters. HDOA is developing public-private partnerships to increase capital investments for large projects and expand use of “smart technology” to increase productivity. 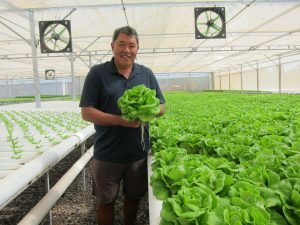 Expanded ‘Aina Pono Farm to School program – The Department of Education is working with local farmers and ranchers to provide local produce and grass-fed beef for school lunches on several islands. ‘Ele‘ele Elementary on Kaua‘i became the first school to serve kalo on its menu. 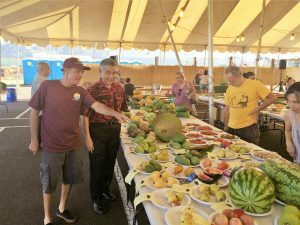 Students in the Kohala and Mililani school districts are also enjoying fresh island food. 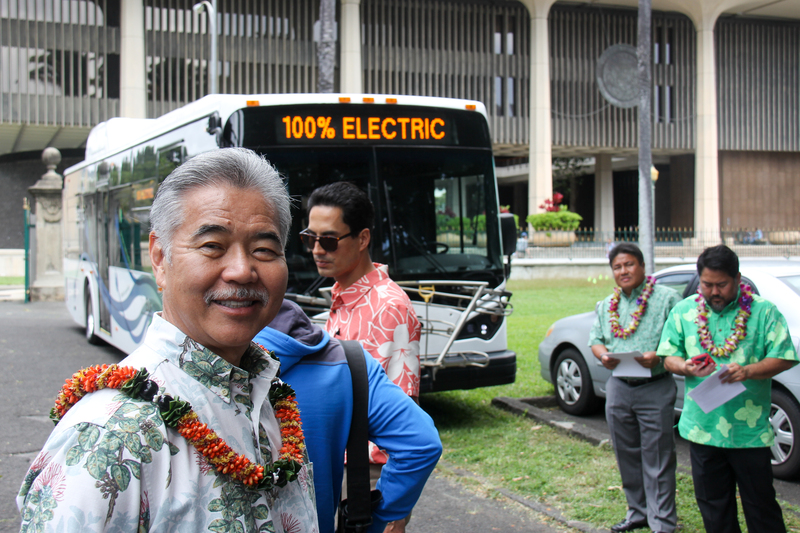 The state’s expanded use of electric and hybrid buses will reduce dependency on fossil fuel vehicles. 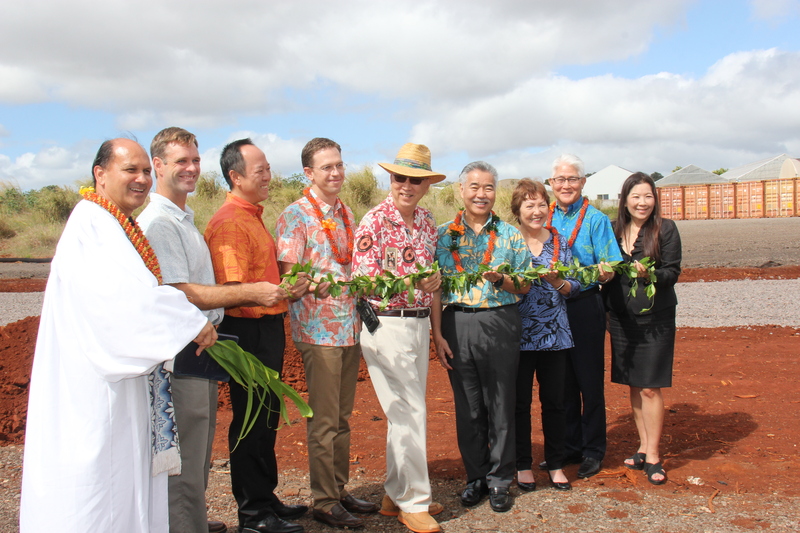 New solar farms, such as the NRG Energy project in partnership with Hawaiian Electric Co., will help the state reach its clean energy goals. 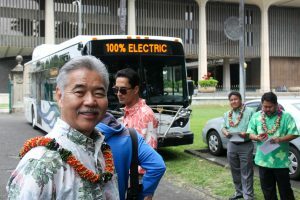 Launched a green energy future statewide – Hawai‘i continues its leadership as the first state to set a target of generating 100 percent of electricity sales from renewable resources by 2045. 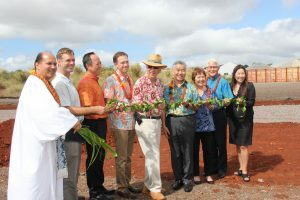 In 2018, NRG Energy broke ground for three solar farms on O‘ahu in partnership with Hawaiian Electric Co. and others to produce enough electricity for 32,000 homes. The Kaua‘i Island Utility Cooperative has initiated a new community solar project to expand access to renewable energy for apartment residents, small business owners and community groups. In transportation, airports are becoming more energy-efficient by installing solar panels and transitioning to electric trams or hybrids to move passengers. Also the Department of Accounting and General Services has finalized an agreement to use water chilled by the ocean to cool several state facilities.